Vancouver Island bear hunting will provide you with a world-class experience you will not likely forget for many years to come. One thing you can count on is that Vancouver Island offers superb trophy hunting opportunities. And here’s an interesting thing about the Black bears on the island, it has been discovered they are a separate sub-species of Black Bear called the Island Bear. Bear hunting for Spring Black Bear is April 15 through June 15, and the fall hunt is September 10 through October 31. If you don’t know the already, hunting on Vancouver Island is done in highly fluctuating weather conditions. Hunters for expeditions there must come prepared to handle Island hunting in a temperate rain forest with daily weather fluctuations and rain any day. For instance in April, temperatures range from daytime highs of 65 F to nighttime lows of 32 F. May is a little warmer, but not much, with temps during the day of 70F. to nighttime lows of 35F. You get the idea, come prepared. Hunters for expeditions there must come prepared to handle Island hunting in a temperate rain forest with daily weather fluctuations and rain any day. For instance in April, temperatures range from daytime highs of 65 F to nighttime lows of 32 F. May is a little warmer, but not much, with temps during the day of 70F. to nighttime lows of 35F. You get the idea, come prepared. Vancouver Island bear hunting, because of its wildly fluctuating temperatures, means you need to pay attention to what you pack regarding clothing for your adventure. Most guides will provide you with a list of things you will need on your trip, but ultimately some of the things you choose to bring will be up to you. Most outfitters will advise you on what to bring when you book your hunt. So don’t waste too much time trying to figure out what to bring, just ask the experts. The ONLY thing not optional and you should not leave home without, is the rain gear. 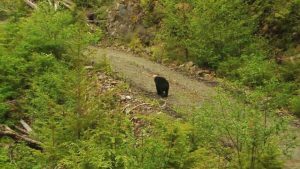 British Columbia (BC) proudly boasts of having the highest Black bear population in North America, and Vancouver Island experts lay claim to having the highest density of Black bears in British Columbia. Game records also indicate that this bear hunting region to be the home of a the most successful hunt on the Island. The reason Vancouver Island bear hunting is as successful as it appears to be, is that game management is their highest priority. Each season’s harvest is controlled which means, you get the size and quality of Bear you want in a hunt. The limited quantity harvested guarantees record book bear harvests with bears in the 6′ to 7′ (and larger) range. Although there are no color phases for Vancouver Island bear hunting, you may run across the odd jet black bear with a white chest patch. The quality of the Vancouver Island bear hunting hides is exceptional throughout the spring season. What about Alaskan Brown Bear Hunting?